Marc Dennis, Jacob's Ladder, 2017 at Dallas Art Fair. With two major art fairs taking place at the same time (April 6–9) on two different continents what’s an art lover to do? You either rack up some more airline miles, cash in your frequent flyer award points or do what we like to do—view Whitehot’s curated selection from each of the fairs online and then imagine that you can take home whatever your heart—and eye—desires. The Dallas Art Fair returns to the Fashion Industry Gallery for its ninth edition with a formidable list of exhibitors—including Gagosian Gallery, Simon Lee Gallery and Skarstedt Gallery, Shane Campbell Gallery, and Lehman Maupin, which are all new to the fair this year. With more than 90 galleries from 16 countries, this year’s show looks like it could be its best. 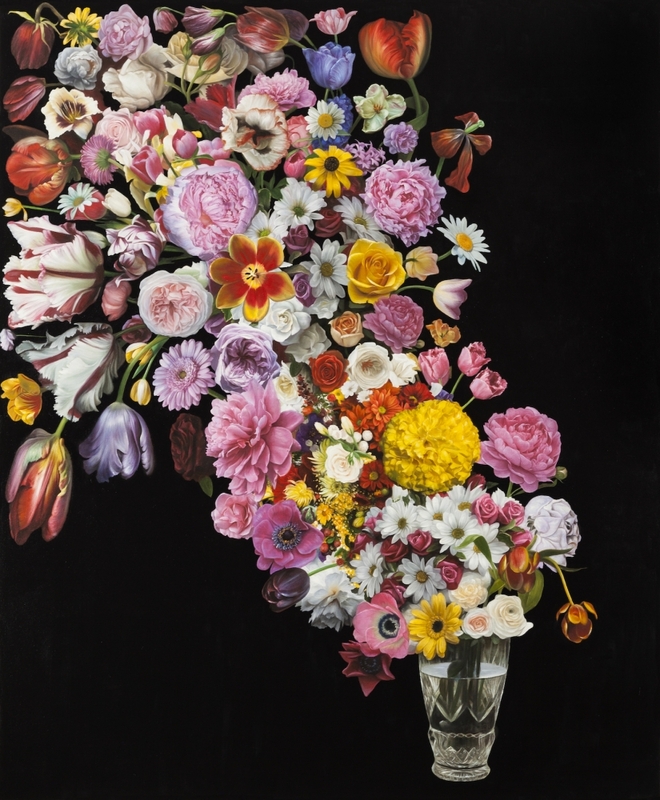 Amongst our favorite artworks being exhibited here are Marc Dennis’ realistic still-life painting of luscious flowers at Dallas’ Cris Worley Fine Arts, Francis Upritchard’s gesturing bronze figure at London‘s Kate MacGarry, Jason Middlebrook’s geometric abstraction on an elm plank at New York‘s Ameringer McEnery Yohe, Luis Gispert’s abstraction made by embedding gold chains in a field of black stones at Palma de Mallorca’s Lundgren Gallery, and Klara Kristalova’s ceramic sculpture of animals in a tub at Lehmann Maupin, with galleries in New York and Hong Kong. Meanwhile, down in Brazil, the thirteenth edition of SP-Arte features some 120 international exhibitors—including Cheim & Read, Galeria Nara Roesler, Lisson Gallery, Marian Goodman Gallery, Mizuma Art Gallery, and White Cube—exhibiting modern and contemporary art and design at the São Paulo’s Cicillo Matarazzo Pavilion, which was designed in 1951 by Oscar Niemeyer, in the city’s historical Ibirauera Park. Standout pieces at SP-Arte include Vik Muniz’s Op Art abstraction from his “Handmade” photographic series at São Paulo’s Carbono Galeria, Haegue Yang’s wooly beast sculpture at Mexico City’s kurimanzutto, Saint Clair Cemin’s surreal ballerina cast in copper at Porto Alegre’s Bolsa de Arte, the Campana Brothers’ stool made with toy stuffed animals at São Paulo’s Firma Casa, Wolgang Tillmans’ photographic still-life of a big peach with other fresh fruits, and Lynda Benglis’ biomorphic gold-leafed sculpture at Cheim & Read.